Background: Rupture of the diaphragm secondary to blunt trauma is not uncommon. It is primarily seen in high speed motor vehicle collisions. Repair of blunt diaphragm injury carries significant morbidity and mortality, especially if diagnosis is delayed. Laparoscopy has been investigated and validated as a diagnostic tool in penetrating trauma. However, its role in blunt diaphragm injury has not been well defined. Protocols defining selection criteria have not been standardized. Methods: Retrospective data review from the Trauma Registry at our institution over a three year period. Detailed clinical data was collected including demographic information, mechanism of injury, method of diagnosis, delay in diagnosis, size and location of the defect, method of repair, operative time, estimated blood loss, and post-operative length of stay. Results: Twenty-four patients were identified with diaphragm injury secondary to blunt trauma. Twenty-one of these were repaired via traditional laparotomy or thoracotomy, two were repaired in a laparoscopic fashion, and one died before any operative intervention. 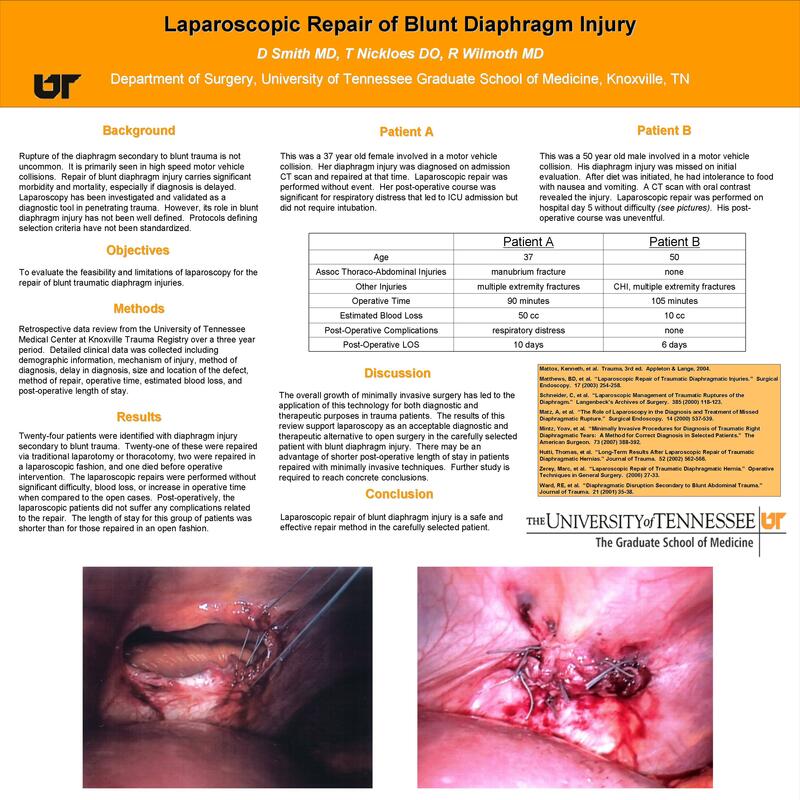 The laparoscopic repairs were performed without significant difficulty, blood loss, or increase in operative time when compared to the open cases. Post-operatively, the laparoscopic patients did not suffer any complications related to their repair. The length of stay for this group of patients was shorter than for those repaired in an open fashion. Conclusions: The overall growth of minimally invasive surgery has led to the application of this technology for both diagnostic and therapeutic purposes in trauma patients. The results of this review support laparoscopy as an acceptable diagnostic and therapeutic alternative to conventional surgery in the carefully selected patient with blunt diaphragm injury. There may be an advantage of shorter post-operative length of stay in patients repaired with minimally invasive techniques.